Grain Store is the latest restaurant by French born chef Bruno Loubet who brought us the successful Bistrot Bruno Loubet in Clerkenwell, a restaurant that celebrates modern French bistro classics. 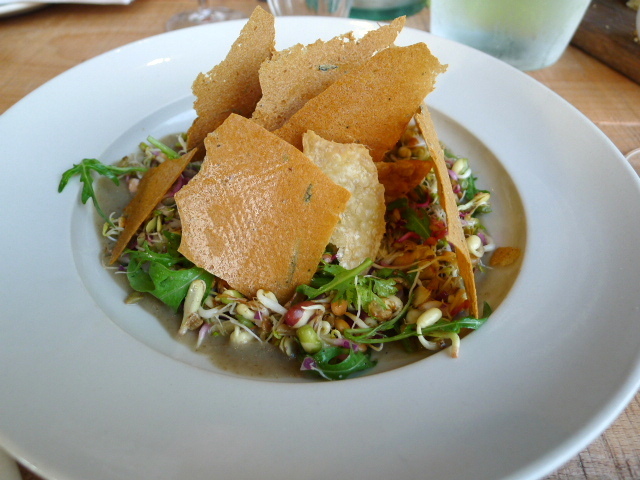 But the emphasis at Grain Store is different with a strong focus on earthy seasonal vegetables. Although it makes good use of meat and seafood there are also lots of lovely vegetarian options. Grain Store is not a vegetarian restaurant, but a vegetarian would definitely not go hungry here. 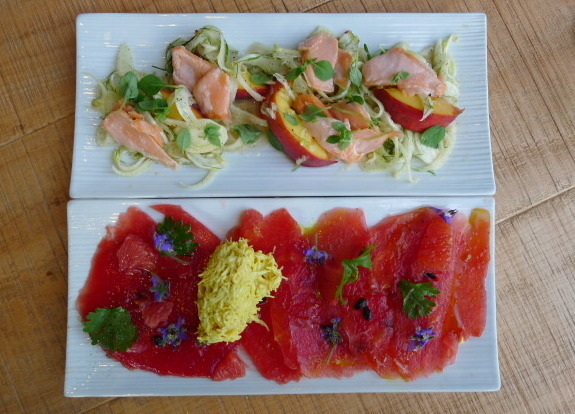 The menu is vibrant and interesting and tells a tale of seasonality and refreshing earthiness. Grain Store occupies a massive space in a former warehouse in Granary Square, right next to Caravan. It’s an inviting restaurant with the décor being as engaging as the menu. There’s an open kitchen, white woodwork, whitewashed brick walls and quirky touches that make the restaurant interesting. There was also a good cocktail selection and we thoroughly enjoyed the Babydoll (£8.50) with rum, rhubarb syrup, orgeat, violet essence, lemon juice and egg white as it was delicious. A light pea mousse tartlet (£9) was gorgeous as the pastry was crispy and thin and the pea mousse filling was as light as a feather. The tartlett would have been better warm rather than cold, but it was nevertheless delicious, especially with a topping of shaved summer truffle and parmesan. An unusual combination of sprouting seeds and grains with a miso aubergine (£7.50) was delicious. The seeds and grains were fresh and crunchy and contrasted well with the smooth texture of the aubergine puree gently flavoured with miso. On top of the dish was a combination of yummy chicken skins and crispy potato wafers. Without the chicken skins, this plate would still have worked very well as a vegan dish. Two very colourful and attractive dishes came out next. One was poached salmon with a fabulously fresh peach, fennel and basil salad (£8). The peaches were lovely and sweet and paired well with the nicely cooked salmon. It had been served with an elderflower dressing which was a touch too acidic, but was otherwise tasty. The second dish was a plate of salted watermelon with borage flowers, pink grapefruit and a curried crab mayonnaise (£7.50). This was under seasoned and the curry flavour of the crab did not work so well either. Chilli braised pork belly (£16.50) was tender and came with a pleasant apricot barbeque sauce. 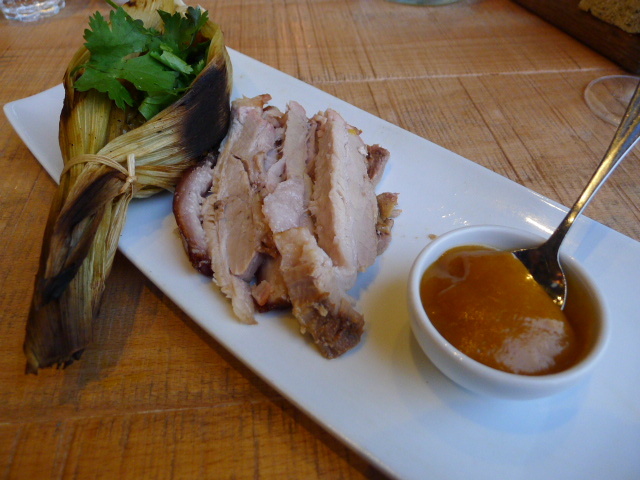 Accompanying the pork was a moreish corn and millet tamale that was warm and satisfying. A duck pastille (£16) was tasty but could have done with some tweaking. The filling of duck, eggs and raisons was spiced nicely but there wasn’t enough duck and the eggs were overcooked. 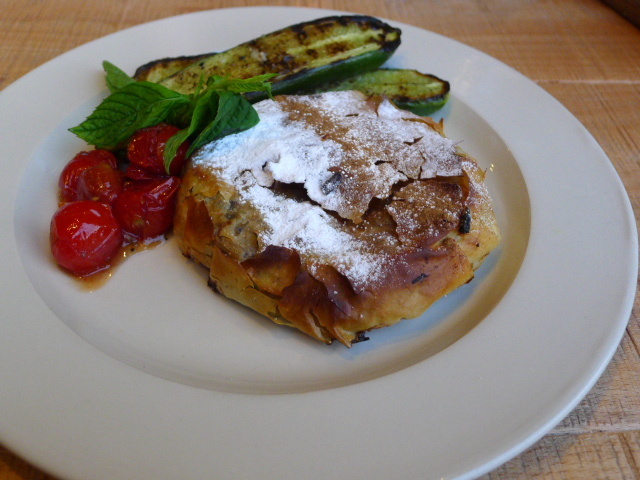 A tomato pickle accompaniment was well done, but some grilled Lebanese cucumbers seemed odd with the pastille. Coconut and kaffir lime green tapioca with sweet potatoes and banana wafers (£5.50) was refreshing from the kaffir lime and creamy from the use of coconut milk. It was really tasty, but the beetroot and chocolate cake (£6) was even better. It was incredible with a rich and creamy flavour and a silky smooth texture. 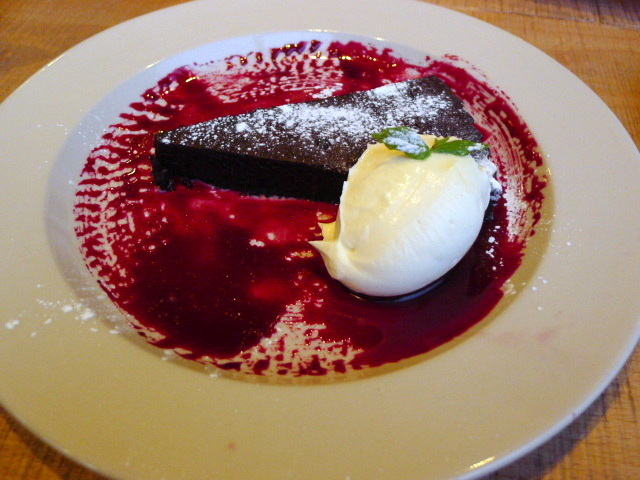 It was served with a delicious red velvet syrup and crème fraîche which balanced out the chocolate nicely. There was much to like about Grain Store, from the relaxed and welcoming décor to the inviting and accessible menu that offered lots of variety for all. 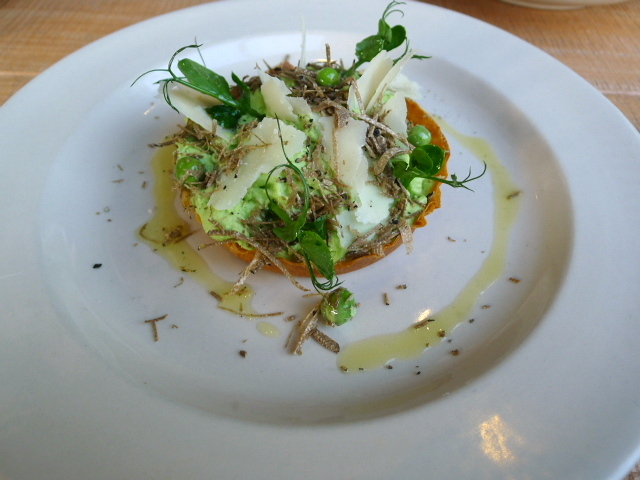 I loved the emphasis on seasonality and the heartfelt use of lots of fresh, wonderful vegetables in the dishes. 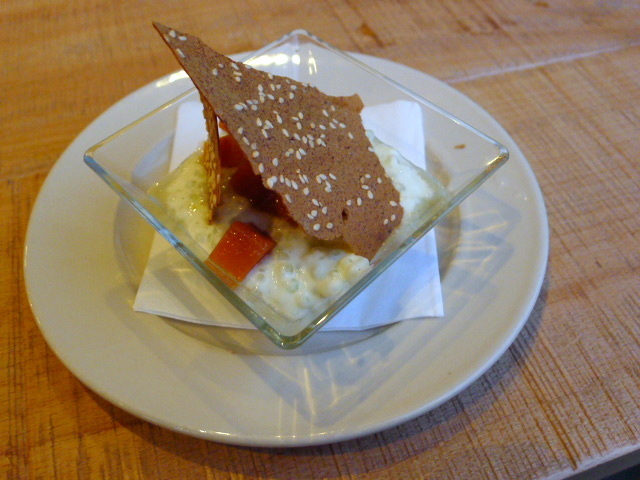 It was bright and happy eating, and with service that was friendly, Grain Store made for a fun place to dine. Prices: £22 to £31 for three courses, excludes drinks and service.